AMI is one of the industry leaders in refurbishing interiors of aircraft and marine vehicles. No matter what condition your interior is, we can make it look like new. We specialize in high quality work with the emphasis on elegance and style. We work with you to revitalize what your vehicle can and should look like. We offer a wide variety of materials and colors to choose from to suit your needs and desires. AMI specializes in design, modification, configuration, and reconfiguration of aircraft interiors for the commercial and general aviation markets, including Boeing and AIRBUS. All aircraft interior work is released with FAA and EASA required documentation. 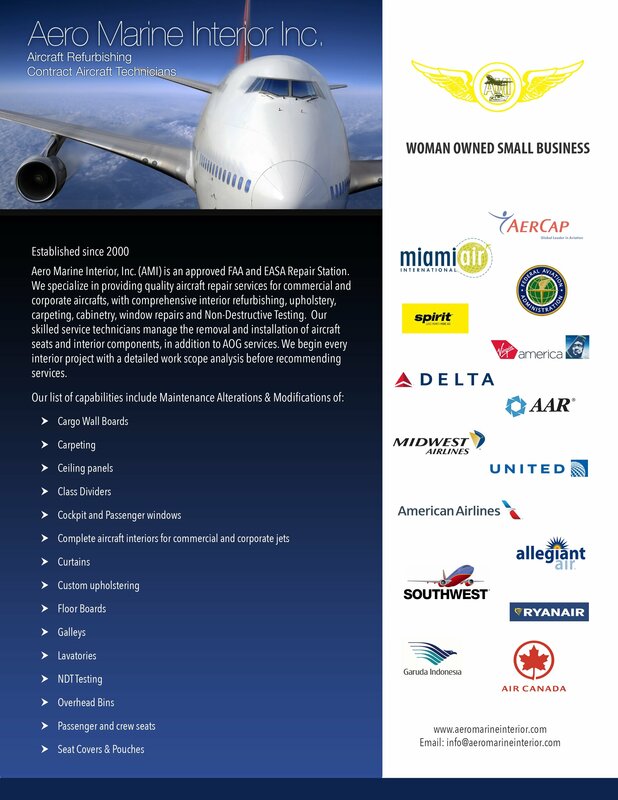 AMI has extensive experience working with corporate clients who need to refurbish commercial airline seating. All aircraft seats are released with complete Flammability Test Reports (TPR) and includes all FAA and EASA required documentation. Passenger Seats (9G and 16G), Business Class Seats, First Class Seats, Premium Economy Class, Economy Class Seats, Pilot/Co-Pilot Seats, Navigator/Flight Engineer Seats, Flight Attendant Seats. For large deployments, AMI will deploy local management staff to ensure the smooth running of the team. The shortage of skills across maintenance, conversions, installation, production and modification means that industry needs suppliers who can reliably provide experienced high quality candidates at short notice. We can supply, overhaul or exchange any item or piece of equipment within the aircraft cabin, with minimum lead time delays. We can also carry out Ad-hoc maintenance on the Line, during Base Maintenance or within one of our FAA approved workshops. AMI employs plastic thermoforming production to construct a wide variety of strong, durable and exceptionally lightweight mold fabrications for aircraft. Our capabilities include: All types of plastic sheets with various thikness and sizes. All repairs will be performed by our staff of A & P’s and FAA certified window repairmen. All repairs are returned to service with an FAA Form 8130-3 Airworthiness Approval Tag.